Tube stations are noted for having the drop-pit between the tracks. The only tube stations (those underground) that dont have a drop-pit are those on the Waterloo & City Line and at the former Aldwych, however there are reasons for this, e.g. the Waterloo & City is not a traditional tube line. 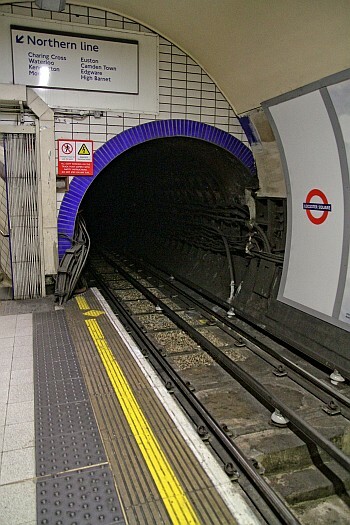 Normally the entire length of track within a tube station has the traditional pit whilst in some cases a concrete base extends slightly out of the tunnel sections. A couple of stations on the Piccadilly and Central Lines have short sections of ballasted track within the station environs. Leicester Square’s eastbound Piccadilly platform has a substantial section of ballasted track followed by a lengthy concreted section and so tops the list of the few rare stations with this feature. The entrance canopy on the Hippodrome side has changed radically. 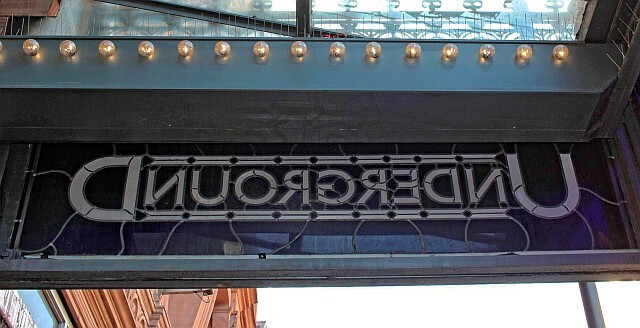 This was it before it recieved fancy glass lettering. 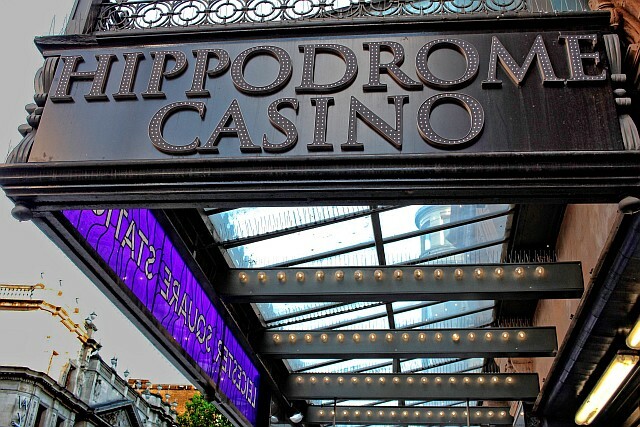 The framework remains basically unaltered but the sides are hidden by new hording bearing the Hippodrome name. The fancy glass ‘Underground’ bit can still be seen by looking up from the inside of the canopy, this picture shows it before it was covered over. Bowroaduk on Flickr has this image with a different view of the ‘UndergrounD’ bit. Leicester Square station was once the heart of the Northern Line. In the 1950’s provision was made for a major control centre which had originally been at Kennington. It was sited within one of the former lift shafts at Leicester Square and known as the Regulating Room (Lower level). This began operations in January 1958. The lower regulating room controlled all of the Northern Line except the section from Tooting to Morden which was controlled by a newer upper regulating room sited above the station. Apparently the regulating rooms were the first on the underground to use Dell programming machines rather than the old method of using sheets of punched card or paper roll. The Dells used plastic rolls, eight feet long and punched with holes. The role of the regulating rooms was to ensure the tube trains ran on time. Regulation was automatic however signalmen took over if problems arose. Leicester Square’s role in controlling trains did not last very long. Its operations were transferred to Coburg Street and the regulating rooms closed for good on 13 December 1969. 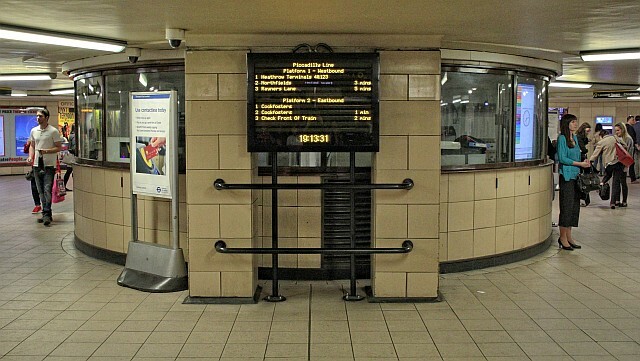 Next Post: South Kensington station remodelling – a joke?